Things are looking up, now that knitting with the dread Classic Elite ’03 Tweed is finished, since that made my hands feel dirty, and it’s onto my handspun. I’d have washed the yarn before knitting the sweater, only in a fit of preparation some time ago I’d wound all the skeins into center-pull balls. That wasn’t going to come undone, so I just knit as fast as possible. That got me into trouble when I started the yoke. I just sailed along, not noticing that there was a very distinct gauge change after the yarn switch. 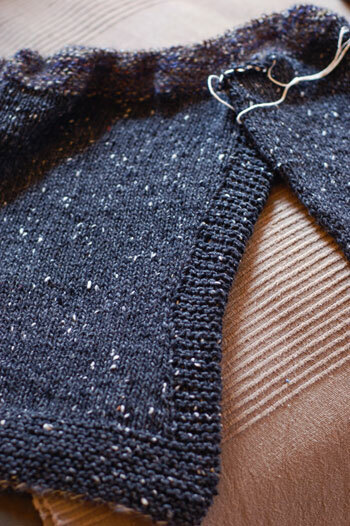 When I finally saw the puckering at the edge of the garter stitch, I took the sweater off the needles and found that the shoulders were about 10″ too big around. That’s not something you can fudge, so off the yoke came. Down 2 needle sizes was the ticket and it’s smooth sailing again. I did some simple waist shaping that worked out very well. My usual waist shaping is 4 sts. per decrease row, 2 on either side of the side seam, every inch until the waist is the proper measurement, knit about 2 inches, and back up again. I am short-waisted, so measure yourself, of course. I waffled about where to do the decreasing on this sweater. Inside the garter strip, so that the strip was shaped like an hourglass or at the outside edge of the strip, not affecting its shape? I opted for the latter, decreasing the last 2 stockinette stitches before and first 2 after the garter strip up the sides. K2TOG before and SSK after gave a nice edge to the stockinette, and picking up the bar between the first and second stockinette stitches after and between the last 2 stockinette stitches before the garter bands made a nice increase. I’ve decided on another change for the fiber club and will be offering a double dose of fiber for an extra $45. There will be a little option box you can check when ordering. Are you watching it? You should be! It’s just the sweetest, most morbid, super-saturated, wonderfully charming show on. Also, in the second episode, there’s KNITTING. Actual knitting, with needles and yarn and proper terminology, and when the garments are tried on, the knitter sees the glory of his projects and utters one word- “Sweet.” It’s funny because that’s what happens in this house, too. love cobblestone – the mods are wonderful! pushing daisies is great, one of my new favorite shows. both hubby and i cracked up at the knitting on last nights show. i’m in class on wednesday nights so i didn’t watch pushing daisies last night but i’ll watch it online sometime this weekend. I love Pushing Daisies – I’ll get to watch it either on the Friday night repeat or online this weekend. I’ll be waiting for the shop update. Yeay someone else watching Pushing Daisies! I just watched the 2nd episode I recorded and knitted gun cosies! Just another reason to love this show. Maybe I’m still angry that Veronica Mars got canceled, but I’m having trouble getting excited about any new shows. I was terribly happy to see the (accurate!) knitting content in Pushing Daisies, but I was annoyed by the whole 13 years, 65 days, blah blah blah thing. I’m a curmudgeon today and I can’t help it. Sorry to hear about the dirty yarn, but it sure is pretty. I saw the first episode of Pushing Daisies, and I liked it!, but I had to miss episode #2. I probably shouldn’t watch it anyway, everything I like gets canceled! Oh man I love Pushing Dasies, I totally squealed last night when they mentioned knitting. It was fabulous, and all his knitted offfice supplies, love it. I want to spread the word about this too, because I’m so afraid it will get cancelled like everything I love (like wonderfalls where Ned is from). I love Pushing Daisies too…I was most excited by the fact that because he had his knitting needles with him he saved their lives! It’s nice to know that should I ever find myself stuck in a plastic body bag with my hands tied together that I will be able to escape!!! Cobblestone is looking great! It’s really neat to see how your side shaping looks, with the decreases/increases outside of the garter band. YAY, cobblestone! It’s looking gorgeous, as always. MAN I CAN’T WAIT FOR THE FIBRE CLUB! WANT WANT WANT WANT! I swear I totally better not miss it this time. Cobblestone is looking lovely. Once you hit the yoke it goes really quick. Well- if you knit it of course. I don’t own any guns, but I want a knitted gun holster…like now! And I love that knitting helps save the day! I’m watching. Here, because I get Canadian channels, I get to watch on Tuesday. This is so pretty! I’m loving the yarn. My cobblestone is feeling like it’s taking a million years, too! I’m right there with you with Pushing Daisies. WIthout the sticky-sweet storybookisms, the morbid wouldn’t work. And vice-versa. It’s my favorite show right now. Loved the knitted holsters.